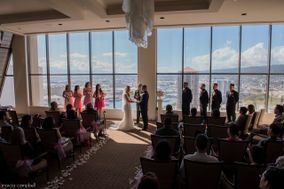 We had our wedding reception here and are so happy we chose the Plaza Club. We were working with Yaneth from the Plaza Club and she was everything we wanted in a contact. She was very professional, gave us very complete instructions on what we needed to provide (and reminders beforehand), offered many suggestions for how to arrange the room, was very accommodating if we had any changes, and she did an amazing job of organizing our photos where she created a wonderful display setup on tables near the buffet. We had so many of our guests come by to compliment us on the photo spread she did! - You don't have to deal with Waikiki. We wanted to avoid Waikiki because we didn't want to deal with all the people on vacation, valet parking, etc. The Plaza Club is downtown so is easy to get to. - Every employee we worked with was professional and very accommodating. All the staff was very nice to our guests, very helpful, and all very professional. We especially liked working with Yaneth, who was our coordinator from the Plaza Club. - The food was awesome! All the drinks, appetizers, brunch items, and a special ice cream bar that we added was a big hit. We even ordered our wedding cake from them. We looked at A LOT of venues when trying to decide where to have our wedding. I didn't want Waikiki but it had to be not too far away from our church. After checking out The Oahu Country Club, The Pacific Club, Richard Street Y and The Honolulu Country Club I found them all lacking for one reason or another. The Plaza Club had just started allowing non-members to have special events (ie. Weddings) at the club so we decided to check it out. It is a newly renovated space in downtown Honolulu, 5 minutes from our church with beautiful views of Honolulu Harbor and the Ewa Plains. My fiance and I were in love with the vibe, which totally matched the "townies" that we are! The staff of The Plaza Club goes out of their way to make sure you have the wedding of your dreams! It's such a unique venue (not one of my 170 guest had ever been to a wedding there before) so it was fresh for everyone, not overdone like some of the other wedding venues out there. I would tell anyone wanting to get married in Honolulu, but maybe not in a Waikiki hotel, or if you want a downtown feel to check out The Plaza Club, you won't be disappointed! Dulce Sanders of the Plaza Club was extremely friendly and helpful. The venue was beautiful and worked great for what we envisioned. The parking was much better than Waikiki. The food was done extremely well and was priced well. We had our reception on the 21st floor of the plaza club and overall, it was really nice. There was also the option to have our reception on the 20th floor, which is still nice...but it is definitely not as beautiful as the room on the 21st floor. I'll start with the food, it was amazing. We got the buffet with fresh island fish with lemon burre blanc and the pulehu chicken. It was so delicious. The buffet also came with 5 different salads and a couple sides. They were all hits with our guests. They kept coming up to us and telling us how much they enjoyed the food. We also had them do our cake, and WOW it was so yummy and beautiful! The venue is gorgeous so we didn't actually bring in any decorations of our own. I would definitely recommend this venue, but we did have a couple hiccups that I think if brides are aware of them...they can easily be avoided! Make sure the staff know to raise the blinds - the blinds were down for the first half of cocktail hour so our guests weren't able to take in as much of the view. Make sure the staff know to dim the lights - the lights were all the way up going in to dinner service. A bridesmaid of mine had to ask a few times to have the lights dimmed to get it to the right level for ambiance. Make sure your instructions for the bar are communicated clearly - our guests were being charged for drinks they shouldn't have been charged for. It was an upset for me at the time, but the coordinator sorted it out quickly enough. Overall, we highly recommend the plaza club. The view of downtown was stunning and the food was so so good.